Last night was our inaugural Opus: Testing community composition workshop, and what a treat it was! Special thanks to our baritones Alex Samaras and last-minute stand in Graham Robinson, Matthew Fava and the CMC, and of course composers Patrick Arteaga, Andrew Clark, Willyn Whiting, Jonathon Moir, Sean Goldman, Yuting Lin, James Lowrie and Michael Brooker for sharing your music and insightful discussion. We were in great company! Check out our Opus: Testing tab at the top for details on our June/July assignment! Musica Reflecta invites the Toronto music community to OPUS: TESTING, a free monthly music writing workshop open to musical authors of all flavours. Each month, we’ll offer a new palette of instruments or voices to be the subject of a 3-5 minute composition. 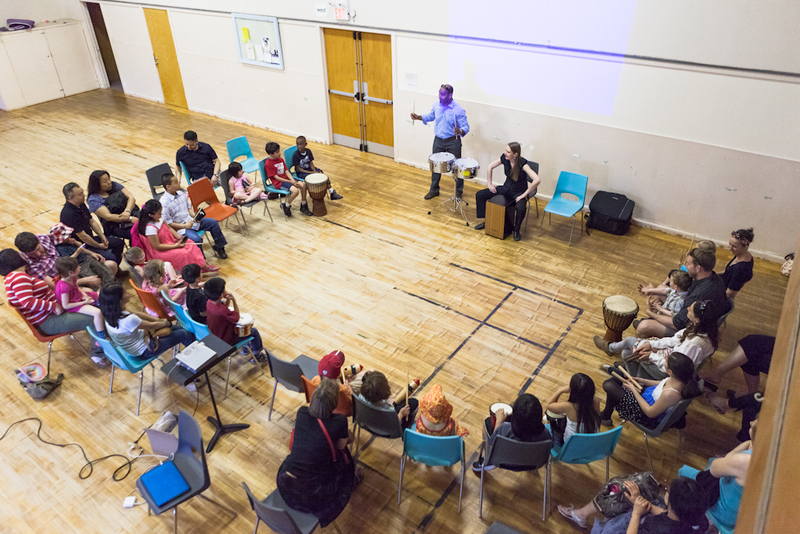 Embracing Toronto’s multitude of musical languages, OPUS: TESTING is an experimental safe space to try new things out. The object is to encourage musical writers of Toronto’s diverse music community to get their sounds heard by other curious and imaginative ears. Participation is FREE! You need not live in Toronto to submit your work – composers from across Canada and beyond are also welcome. 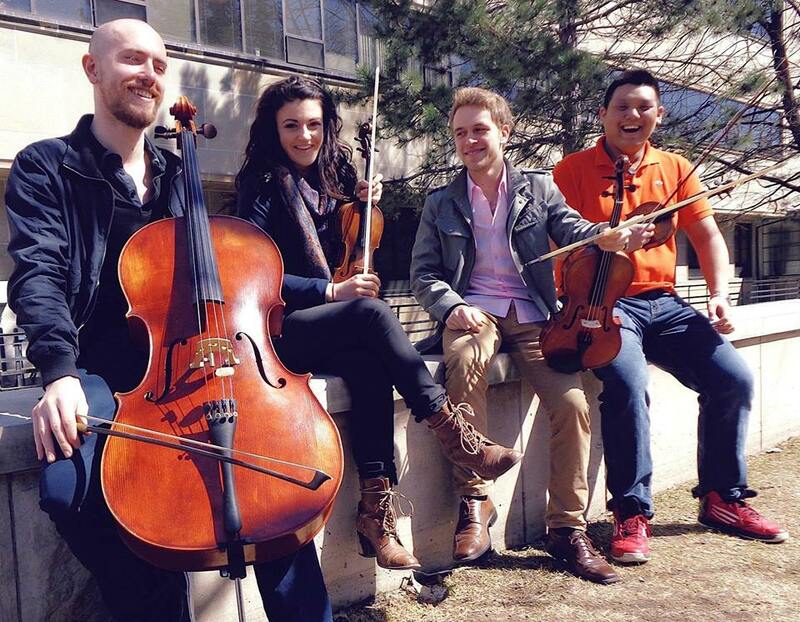 Come see Musica Reflecta ensemble members Evan Lamberton, Meagan Turner and Luca Casciato team up with fellow string quartet member Samuel Choi to perform as recipients of the 2014 Felix Galimir award for excellence in chamber music! Shout out to composer Sean Goldman for some amazing Can-Con. Congratulations to all, you definitely deserve it! Established to honour the memory of the legendary violinist and chamber music coach, the Felix Galimir Chamber Music Award is given annually to the most promising string or piano chamber music group enrolled in the Faculty of Music’s chamber music program. Past winners have included the Cecilia and Tokai String Quartets. Proceeds to benefit the Felix Galimir Chamber Music Scholarship Fund. 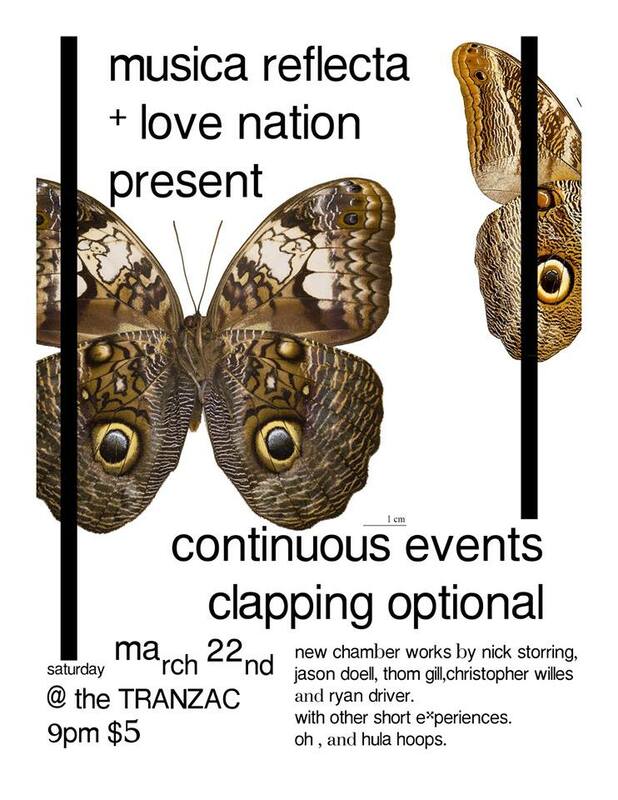 Musica Reflecta and Love Nation team up for a concert of continual music making at the Tranzac. 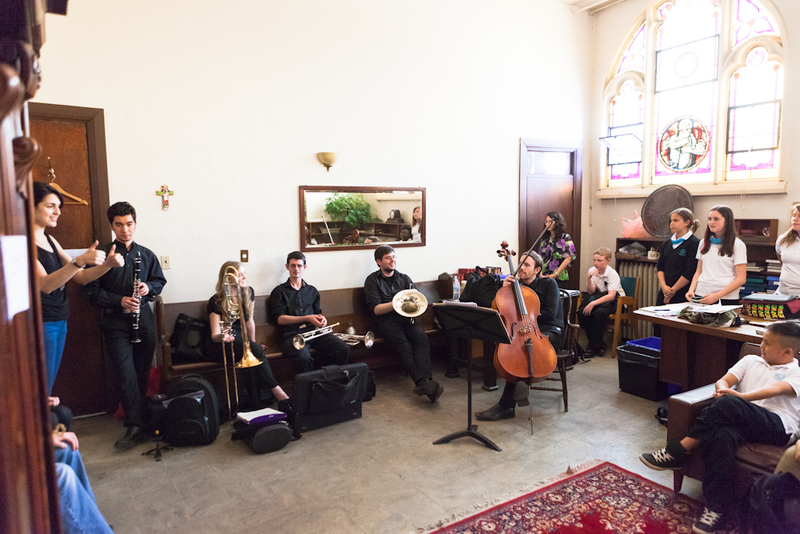 Oscillating between chamber music premieres and solo improvisations, the night will feature new works and performances by some of Toronto’s most adventurous contemporary composers and improvisers. Thom Gill and Colin Fisher created the Toronto-based Love Nation label out of a wanting to document the less-polished sides of their friends’ outputs. Demos, dubs, bootlegs, remixes, and other rough-hewn sonic experiments are a-plenty in our local music community. Run time approx 100 minutes, no intermission. General admission, no fixed seating. 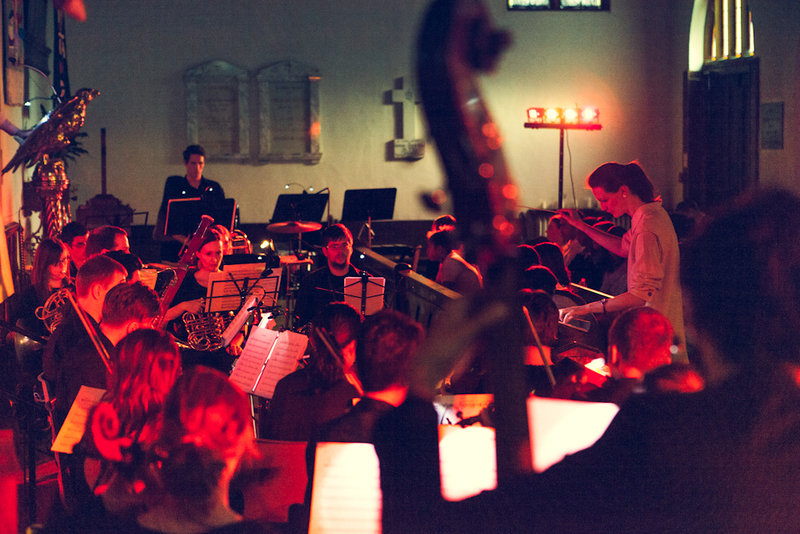 Happy New Year to our whole community of Musica Reflecta musicians and supporters! We’re feeling very lucky to look back on a really fabulous year and are looking ahead to many more exciting collaborations and concerts in 2014. Thank you for all your love! 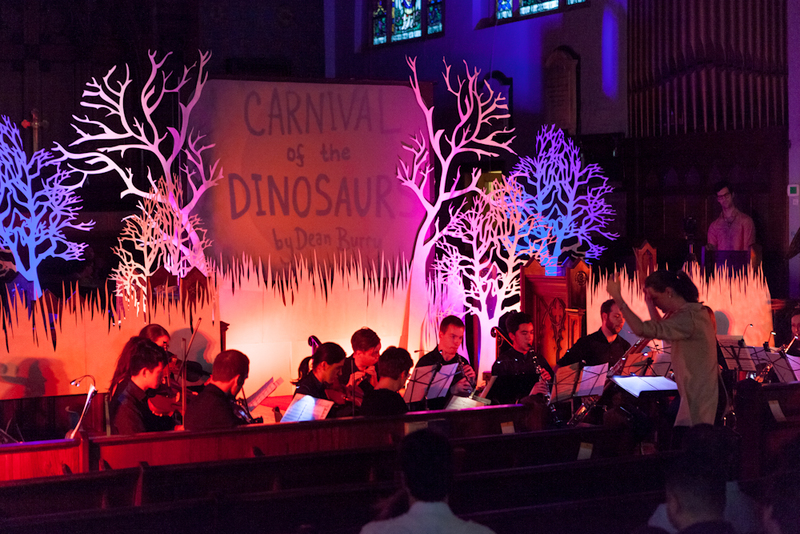 This holiday season, we had the good fortune of being chosen as the best concert of 2013 by Musical Toronto for our kids extravaganza concert “Peter and the Dinosaurs“! 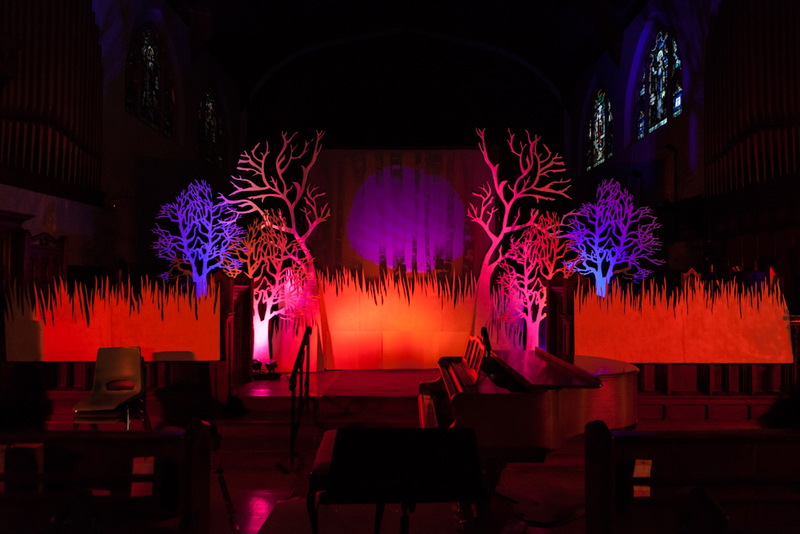 What a great project that was with fantastic collaborations – sharing our success with Madeleine Collective as well as composers Chris Thornborrow and Dean Burry, among all the fantastic performers and crew! Stay tuned for show updates this winter and spring! 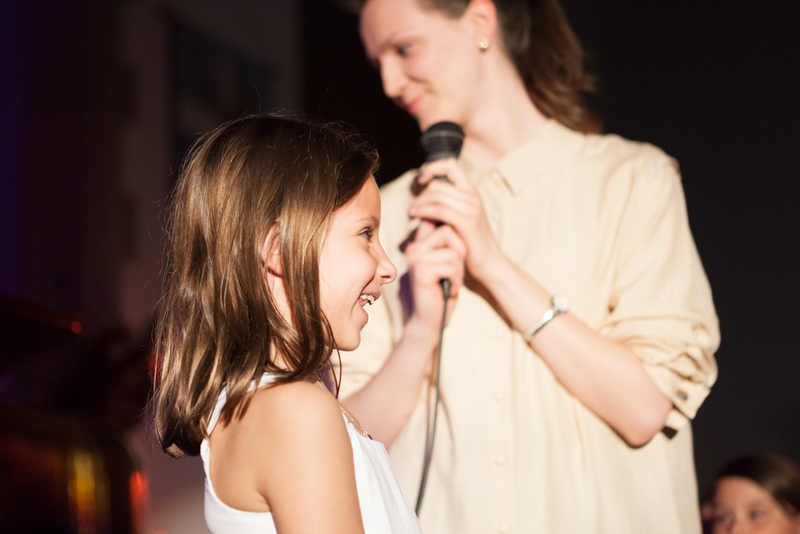 We are thrilled to bring our fun kids programme to Gallery 345 in Toronto’s west end! This is a kid and family friendly show! The performance will run roughly 50 minutes with no intermission. After a much-needed summer hiatus, Musica Reflecta is getting back in the game with an inspired new season of collaborations and new friends. Musica Reflecta 2013/14 will feature the melding of blossoming minds such as an instrumental narrative piece with Loose Tea Music Theatre, a continuous ensemble performance with jazz soloists c/o Love Nation Records with Chris Willes and Thom Gill, a brand new kids’ contemporary concert series with co-host Gallery 345 and much more! MR is also incredibly proud to announce co-producer and soprano Jelena Ciric‘s acceptance to Berklee Valencia’s Master of Music in Contemporary Performance program this fall! While we are sad to see one of our key co-producers and collaborators go, we are certain they couldn’t have picked a better candidate! Have an amazing sabbatical (and send us postcards and oranges)! Exciting things are happening! Stay tuned, friends! Wow! What a show – thank you to everyone involved in our magical afternoon for our kids appreciation show “Peter and the Dinosaurs! We are happy to read the praises of our latest endeavour, our Peter and the Dinosaurs Kids concert on musicaltoronto.org by John Terauds! High energy performance with a great turnout and warm support by the Danforth community in Toronto and our friends and colleagues. Bravo to everyone involved! 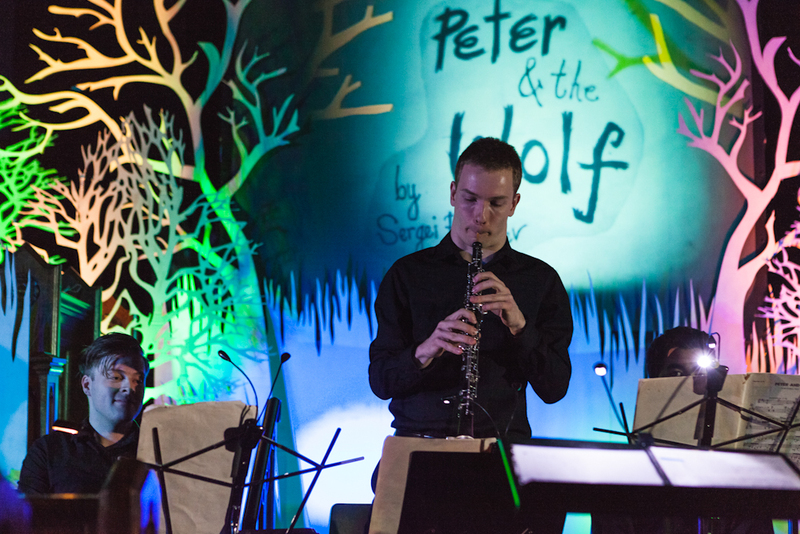 Musica Reflecta performs Prokofiev’s Peter and the Wolf. Pictured here, the duck played by Aleh Remezau. 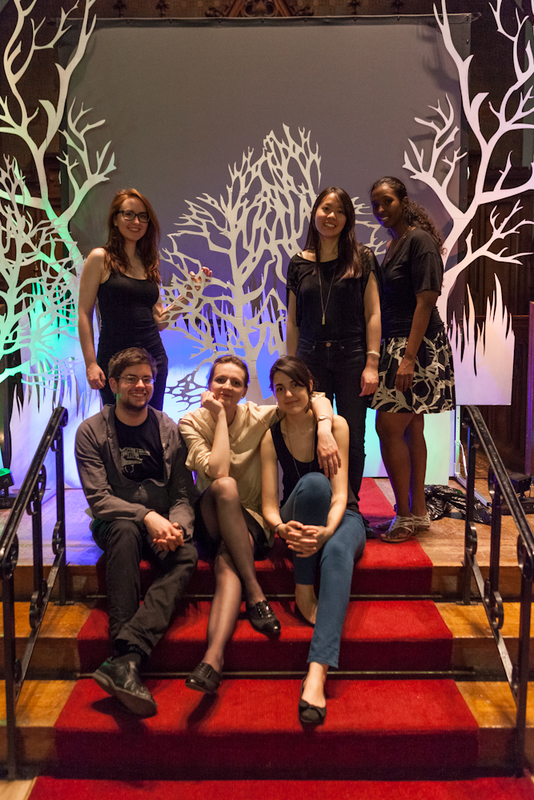 Members of Musica Reflecta and Madeleine Collective pose for well deserved post-concert victory shot! ANNOUNCING: PETER & THE DINOSAURS!!!!! 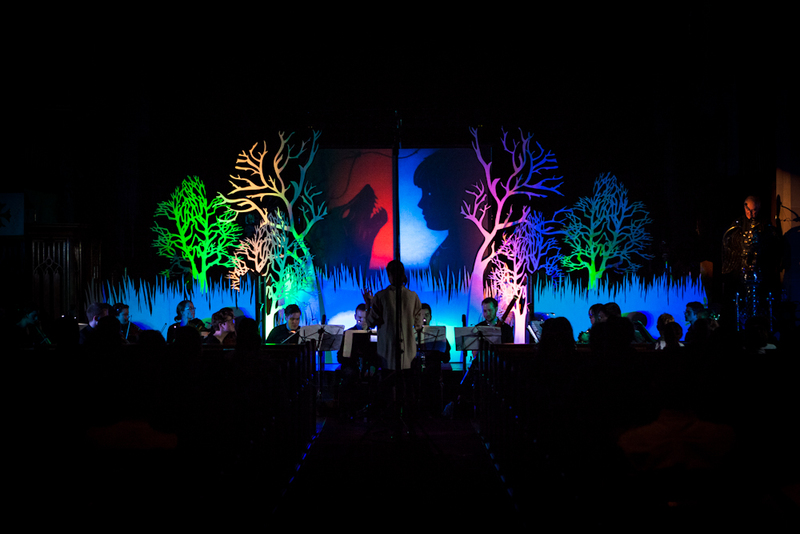 Peter and the Dinosaurs is a magical collaboration between the Musica Reflecta chamber orchestra and the visual artists of Madeleine Collective. Watch colourful picture books come to life as stories are told through an enchanting combination of art and music. 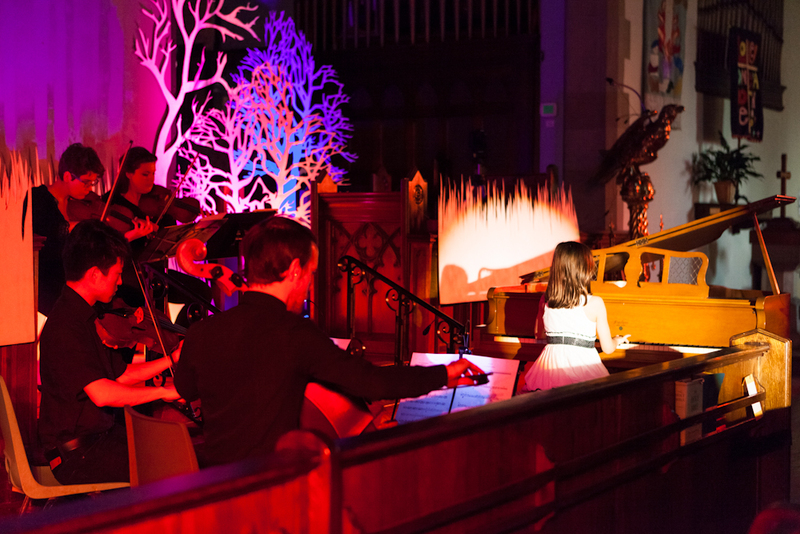 Suitable for all ages, the concert invites children to attend for free! In addition, there will be a free music workshop for kids before the show. FREE Kids Percussion Workshop @5:30pm. Exciting news! Musica Reflecta is proud to announce its upcoming performance. 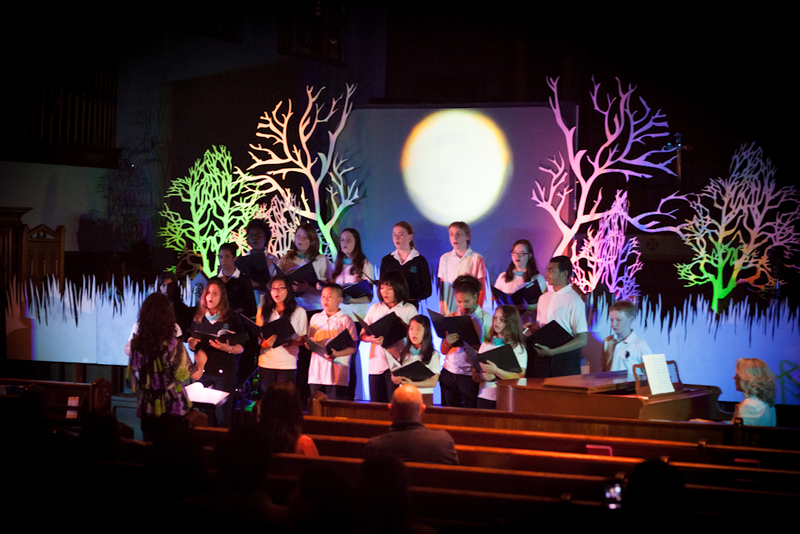 Keep Sunday, May 5th open for a colourful multimedia children’s concert featuring engaging community partners and of course, plenty of young talent! This event features a collaboration with young local visual artists of Madeleine Collective, a first for MR! Stay tuned for more details and previews…!